CSO Insights just released the results of its annual Lead Management Optimization (LMO) Study. The study, conducted in partnership with Sales and Marketing Executives International (SMEI) and Marketo, helps shed light on the role marketing plays in lead generation for sales by showing how marketing organizations are investing their time and money into efforts like lead scoring and nurturing, then relating this data to sales results. 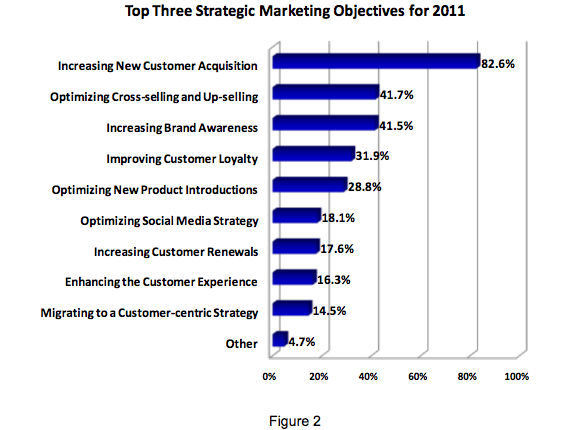 The results were encouraging in that marketing seems to be shifting more and more toward alignment with sales objectives. The chart below shows how funds were allocated for 2011 among companies surveyed. This year less than 42% of firms cited brand recognition as a top objective, a significant drop from 54% last year. Social media jumped way up on the marketing radar, with 18% of companies citing it as a key objective as opposed to last year when it was lumped in with “other.” And customer loyalty increased in priority this year – cited by 32% of companies as opposed to 2010’s 25%. That said, lead generation seems to be slipping steadily over the years among companies surveyed, with sales relying increasingly on avenues other than marketing-generated leads. 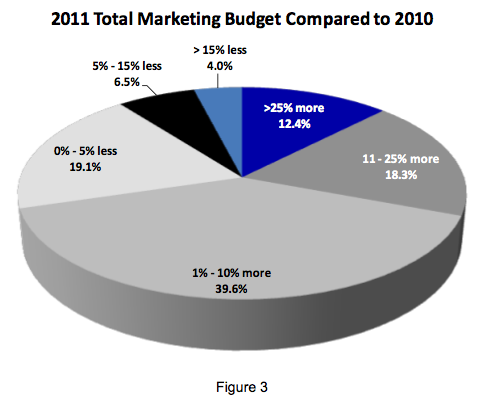 Also, although marketing budgets have increased slightly over last year, allocation of funds to lead generation programs has not increased. This will present a challenge for marketing organizations to step up their games and deliver more leads for less. The study did find that those companies with a formal lead scoring process lead management systems showed greater satisfaction with their processes and results than companies that had no such systems in place. In its analysis of the key trends, CSO Insights recommended implementing such systems, including dedicated commercial solutions where it makes sense, and hiring consultancies to help with implementation where necessary. For more info on the CSO Insights’ 2011 LMO Study, check out these two reports, compliments of Marketo: the 2011 Lead Management Optimization Key Trends Analysis and the 2011 Lead Management Optimization Summary of Charts.